This appears to have started with inaccurate captions on YouTube and Twitter videos, which then were cited by all sorts of media outlets. Video of Deontay Wilder punching a mascot on ESPN… without realising there was a real person inside! 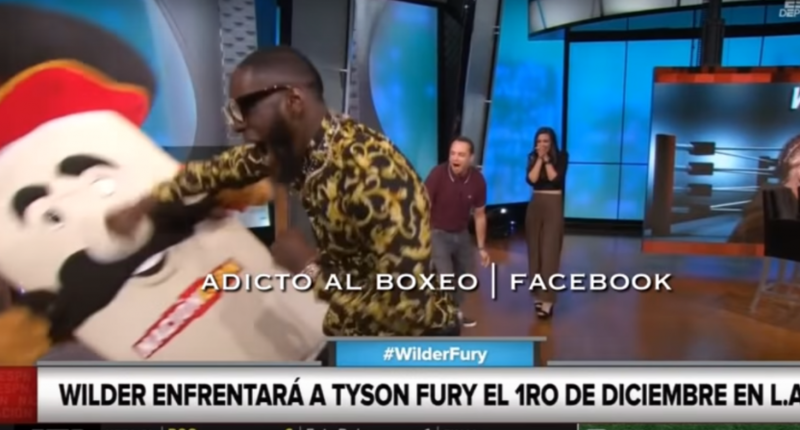 According to several online reports the man in the mascot costume had his jaw broken by the punch and Wilder is claiming that he didn’t know there was a real person inside the costume. I’m not entirely sure how Wilder didn’t know there was a real person inside the costume or why the producers would allow this to happen but it’s still hilarious. There are no citations of those “online reports,” but there are some linked tweets, including two now–deleted ones from ESPN multiplatform journalist Alan Huerta that spawned many of the later replies. However, one of those tweets just said Wilder “is a straight savage for this” and included a picture or video, and the other one just included a picture or video. Maybe those videos also had the “broken jaw” commentary. At any rate, an ESPN spokesperson told The Wrap Sunday that “Reports are inaccurate. No injury was caused to the Mascot performer during the Nación ESPN segment,” and an ESPN report Monday said “Despite initial reports, the man inside the costume was not injured by the punch” (and, you know, they’d probably know). So in the end, this was all a poorly-sourced tale of sound and fury, told by many idiots, and signifying nothing. Maybe it will lead to some good questions when Wilder appears on the first week of Kristine Leahy’s upcoming FS1 interview show, though. Hopefully there won’t be any punches thrown during that one.